Ah, a day in the life of a food blogger. I never know where it’s going to take me–and yesterday, it took me to a local food truck to learn how to make authentic Neapolitan Pizza. Now, I just have to say for the record, that Neapolitan Pizza is the real deal. It’s not something that comes out of your freezer, and you may not live in a place where you can even get it delivered. This is a classic pizza style from Italy that features a very thin crust, and the crust must be prepared by hand in order to qualify as Neapolitan (there’s a certification process and everything!). It’s then baked in a very hot oven, usually around 800-900 degrees, and that’s what creates that beautiful, puffy crust, that’s crispy and chewy on the outside, but still soft on the inside. 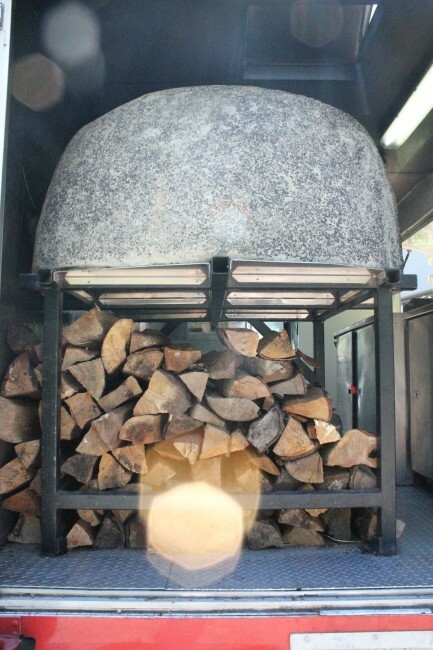 The Community Pizzaria Food Truck comes with a built-in, wood-fired, pizza oven. The simplest of these pizzas are done Margherita style. Traditionally, these pizzas were prepared by the wives of Italian fishermen as they came home from a day of work, and the colours reflect the Italian flag: red for the tomato sauce, white for the cheese, and green for the basil. It’s the epitome of taking simple, fresh ingredients and preparing them in such a way that they sing. It’s what Italian cuisine is known for. If you’re a big fan of Italian cooking (as I am), you’ll want to get down to Commercial Drive this Sunday for Italian Days. The Drive becomes car-free, pedestrian-only, and all the restaurants and shops come out to play and celebrate Italian Culture in Vancouver. There’s music, food, dancing… it’s an awesome party. And free! Hmmm… which one of these was made by trained pizza chef, and which one was made by me?? You can also, for free, have a slice of this exact pizza I learned to make (and then got to eat–NOM) yesterday. Mogo is a new kind of online online financial service, based right here in Vancouver, and they aim to be more socially responsible than some of the other banks out there. While many banks are raking in billions in profit on interest and the like, Mogo aims to help save your money and keep you out of debt–their whole philosophy is Do More, Spend Less. I think we can all get behind that. 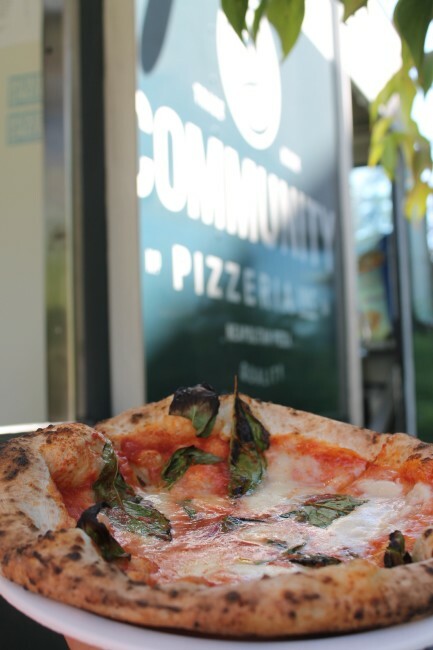 Mogo will be sponsoring the Community Pizzeria Food Truck on the Drive this weekend, as part of their Mogo Perks Program. Sign up for a Mogo membership (either online or in person on Sunday), and free, authentic, wood-fired Neapolitan (they call it MogoRita Pizza--*rimshot*) pizza for you! They’ll be there from noon to 4 p.m., or until it runs out. A little birdie told me they’ll be handing out free swag, as well! Here’s Michael, the owner of Community Pizzeria, showing me how to make a pizza. They have a wood-fired pizza oven built right into their truck. It was super fun–but I doubt I’m good enough to join him on the line on Sunday. I will, however, be in the lineup outside–for free pizza (and I can tell you first-hand, it’s really, really delicious!). Hope to see you there! This post was sponsored by Mogo Money, but the opinions are my own.